Here are some camping tent features that are important for you to remember when you pick out your new tent. You should look for sturdy tent poles, securely fastened grommets, seams that are double sewn, and heavy duty zippers. Check for reinforced seams and corners. Heavy tent poles will help your tent withstand the wind. Good ventilation is also important. Your body releases moisture at night, sometimes up to a quart. Youll wake up rather soggy if theres no place for it to go! Air vents in the top of the tent will help to eliminate condensation on the interior walls of your tent. Mesh panels will allow breezes to make your tent cooler and keep the bugs out. If your tent will be moved every day, its ease of setup and take down is especially important. A tent with shock-corded tent poles will speed setup. If you are staying in one place, however, a cabin tent may provide the most comfort for your family. It will be helpful if your tent comes with color coding to aid setup. You can never have too much space. If you won’t be lugging your tent around, consider getting one that you can stand up in. This will be most convenient when you’re getting dressed. Although backpackers are more concerned about the size and weight, car campers should get a tent that is rated one or two people more than will be using it. Any camper will assure you: it is crucial to have a tent that keeps the water out. A tent should have a waterproof nylon fabric, or be well coated with sealant. Design is an important part of being waterproof. The tent should be assembled taut and able to shed water. Water accumulation on the roof will make it sag and drip through the fabric. A nice feature to any tent is no-see-um netting in the doors and windows. That will help keep those pesky little critters out of your tent. Fabric is an important part of a good tent. 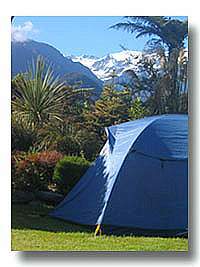 Nylon is used in manufacturing most tents. Well woven nylon is extremely durable and lightweight. Polyester is slightly heavier than nylon, but is more tear resistant and doesn’t expand when wet. Canvas is the most durable, but is also very heavy. Ripstop fabric is essential to a durable tent. A tent’s strength and stability also depend upon the framework. You should choose sturdy, good quality tent poles. A good tent should be flexible. It must be able to bend under the wind conditions without ripping and breaking. An important camping tent feature to look for on a tent is a fly, or at least a tarp to fend off the rain. A rain fly is made of waterproof material that extends over the tent. It should cover the entire tent and provide added rain protection for your tent. The farther down your rain fly comes, the better. The best ones extend all the way to the ground. The rain fly also protects your tent from the harmful rays of the sun that can damage the waterproof coating on your tent. It is far more cost effective to have a rain fly take the beating sun than your expensive tent. A tent with a built in floor will keep out most unwanted visitors. A tub floor is especially nice. It is seamless and made of heavy waterproof materiel that comes partway up the tent side walls. If your tent has guylines, it will be much more stable in windy weather. The guylines should connect through the fly to the pole and the tent. Use a bright, very visible color for the guylines to keep tripping at a minimum. Quality is very important for tent poles. Aluminum poles are lightweight and durable. They should be light, simple and easy to setup. A vestibule is a convenient option you should consider for your tent. A vestibule serves as an entry way or covered front porch on your tent. Make sure that the tent you choose has a warranty. Find out what the manufacturer will cover and for how long. A truly dependable tent will have a life-time warranty. Remember to save the company information when you buy a new tent so that you can contact them if necessary.